Located in North-East Italy, the climate in Venice changes through out the year. The hottest month is July and coldest month is January. During the fall and winter months Venice can suffer from flooding, that in November seems to occur almost on a daily basis. This is known as Acqua Alta. Acqua Alta is a phenomenon that regularly occurs in the city of Venice, most commonly during autumn and spring high tides. 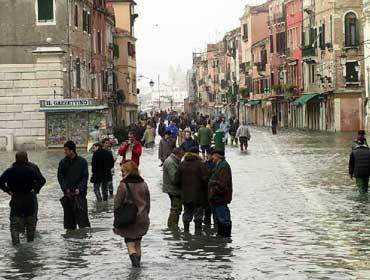 It involves the flooding of the most low lying areas of Venice, or, in more severe cases, up to 96% of the City streets. By official definition, acqua alta occurs when water is higher than 90 cm. (35.4 inches) above normal sea level. When a higher than usual tide is expected in the city, sirens are sounded 3-4 hours in advance to warn the public, but they only start if the level is expected to be above 110 cm. (12% of the surface under water). Spring is one of the nicer seasons to visit Venice. Mass tourism has not really started yet and the temperatures are generally very comfortable. The weather of spring is generally sunny but also there are some chances of rain and thunderstorm. The days are beginning to lengthen, and in fact during the month of May one can expect about 10 hours of daylight. The average temperatures for this season are between 12°C and 21°C (53°F and 70°F). Summer weather in Venice is sunny, hot and humid. The average summer temperature varies between 25°C and 31°C (80°F and 90°F), sometimes, overall in last years reaching the 40°C (104°F) mark, but the evenings are often quite comfortable, except for cases of Sirocco. The Venice weather in autumn is generally lovely and offers marvellous sunsets. The daylight hours are only about 8 to 9 hours a day. Early autumn is usually fairly dry - the wetter season starts around mid-November. The average temperature is 15°C (59°F). Generally the winter weather in Venice is sunny and cold. There are not many hours of daylight in December, but by February the days have lengthened considerably. This season is sometimes wet due to the possibility of fog, Sirocco or rain. Sometimes snowfalls happen in winter. The average winter temperature is around 8°C (47°F).